This table features 140 year old reclaimed wood from historic Charleston, SC! You cant beat the character in this table, the mill marks and some nail holes tell the tale of the great earthquake of 1886, which damaged this building so badly that this wood was installed as part of a full renovation. The top is a full 2"-2.25" thick. The color in the pictures is the natural aged patina with a smooth Annie Sloan waxed finish. 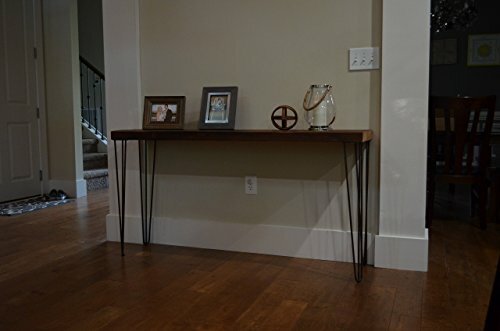 Complimented with natural finished and sealed steel hairpin legs this is a one of a kind piece! Dimensions are 11" wide x 32" tall x 60" long. We can customize dimensions if required, please message us for custom sizes.